The Computer Weekly Developer Network shamefully missed its chance to attend MongoDB World 2018 for the USA leg of the schema-fluid developer-focused database company’s contribution to this year’s conference season. Sorry MongoDB, there was just so much on, yes we’d like to come again and we’ll see you in London in November for the UK leg of the tour. Extenuating concessionary apologies notwithstanding, what did MongoDB CTO and co-founder Eliot Horowitz talk about this year? “MongoDB has always been about giving developers technology that helps them build faster,” said Horowitz, in a kind of upfront ‘yeah, we’re really all about the developers’ message. Horowitz spoke of MongoDB Stitch, the company’s new serverless platform for rapid application development (as in RAD) of mobile and web applications. The services provided in Stitch are meant to give developers access to database functionality while providing security and privacy controls. MongoDB also announced Global Clusters in Atlas, which allow users to create ‘sophisticated policies’ to carefully position data for geographically distributed applications. By dynamically configuring these policies, MongoDB says that users can ensure that data is distributed and isolated within specific geographic boundaries. Similarly, by using Global Clusters, relevant data can be moved close to end-users for worldwide, low-latency performance. MongoDB Mobile was also announced (in beta) to allow users to run MongoDB anywhere. In terms of ‘anywhere’, MongoDB means all the way out to the edge of the network on IoT assets, as well as iOS and Android devices. Previously, this could only be achieved by installing an alternative or feature-limited database within the mobile application which resulted in extra management, complicated syncing and reduced functionality. 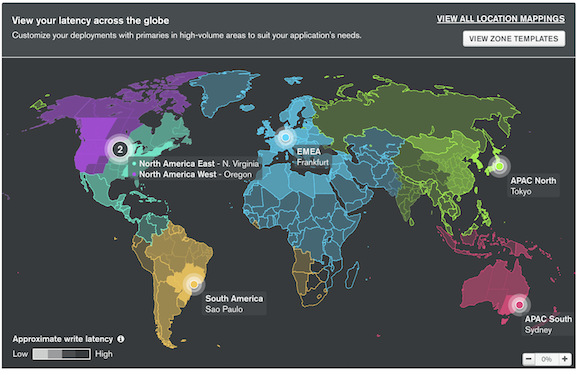 We also hear news this month of advancements in database as a service MongoDB Atlas. MongoDB Atlas is a fully automated cloud service engineered and run by the same team that builds the database. It offers options to automate time-consuming administration tasks such as infrastructure provisioning, database setup, ensuring availability, global distribution, backups etc. MongoDB Atlas is extending the Atlas Free Tier to Google Cloud Platform, in partnership with Google, obviously. This allows the developer community relying on GCP services to build their applications using fully-managed MongoDB. The Atlas Free Tier offers 512 MB of storage and is said to be ‘ideal’ for prototyping and early development. In addition, the company announced a number of new security features for Atlas, such as encryption key management, LDAP integration, and database-level auditing, to offer the most security conscious organisations more control over their data.